If you are looking for inspiration and ideas for your kits purchased at Lil' Lamb's Boutique, you've come to the right place. Some of the best paper crafters on the web are here to keep you up to date with new kits, tutorials and project ideas. I can't complain a bit about the weather here! I've spent more time outdoors this week knowing that the sun may disappear again within the next few days. On those days that have me cooped up inside I tend to grab my summer photos and scrap away. It takes a litte bit of the chill out my bones. Try it- and then tell me these sunny papers don't brighten your day. 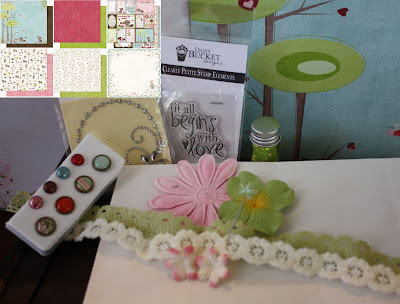 Prima's mix of the Tropics and Paradise lines fit the bill for my last "where is the sun" scrap session. Never skip an opportunity to get something done early. I'm so excited about the Caardvarks challenge this month. 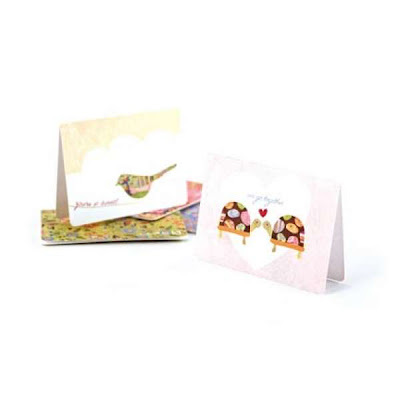 Not just because I got to dive into my Bo Bunny Love Bandit Deluxe kit below, but I now have all my cards done for my 3 sweethearts (my husband and two girls). For my husbands card, I whipped out those deco scissors and made a patchwork with several of the papers (and yes, there is a bit of red in there). I made faux stitches all around, because honestly I'd never be able to get to my sewing machine. Some of the green trim, pleated into a circle, made a great center for my flower at the bottom. The Bo Bunny tag sheet was perfect to pull from for my two kiddos. 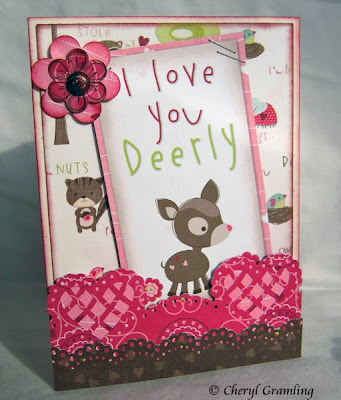 On this card, I grabbed my Deep Edge Lattice Heart punch and Doily Lace Edge punch from Martha Stewart to make the bottom part. Finally for my littlest munchkin, another tag from the tag sheet, some faux stitching around the patterned papers and some handmade punched flowers from the paper in the kit. I topped it off with some more of the green trim and centered my flower with one of the fancy glazed brads. Don't forget, you have until February 1st to submit your entries! Hey loyal readers out there!! Guess what?? Tammy is sponsoring the latest challenge over at Caardvarks! If you don't know what Caardvarks Challenge Blog is all about, go check it out...it is one of the best card challenge sites out there. So, what can you win, you ask?? Well, a $25 gift certificate to Lil' Lambs Boutique! All of the details are on the Caardvarks site, and you will need to link your card to their site. The challenge is to create a card using Red Hearts. Perfect for Valentine's Day, right?? You have until February 1st to link your challenge card! Have fun, can't wait to see what you create! I know what my sweet valentines will be getting this year- check out these adorable Love Notes by Basic Grey! Are you ready to show your valentines how much you care? We've got a few more things in stock that might make your gift giving a tad easier. First up is "Sweet Love" by Little Yellow Bicycle. It's adorably sweet and full of shimmer! Check out this adorable album kit. Little Yellow Bicycle makes it so easy to create a fabulous album in a flash. The coordinating paper fits the album perfectly - no trimming required! And don't forget the cards! 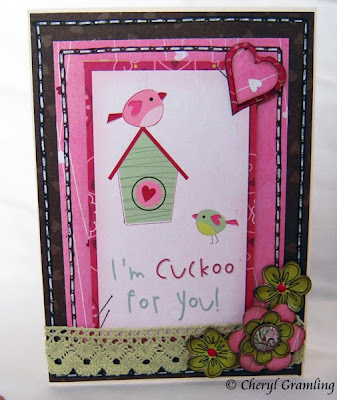 This card kit is pretty much ready to go- just add your special touch with the included embellishments and voila! And Basic Grey's Sugar Rush Kit is perfect for Valentine's Day but versatile enough to take you right into your spring creations. We are excited to be sponsoring a Caardvarks challenge soon. Check back for more details! 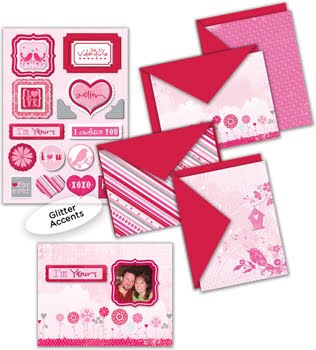 If you like shimmery, glittery, blingy things, Bo Bunny~ Snowy Serenade~ Deluxe Scrapbook Kit is just the ticket. 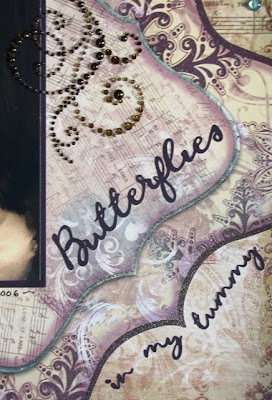 When I received this kit and saw the gorgeous papers and the amazing butterfly and crystal flourish, I knew exactly what picture I HAD to scrap. My dear daughter's first choir concert in middle school gave her the opportunity for her first solo! She was soooooo nervous. Instead of using the Decorative Edge Paper straight on the page, I turned it on an angle so more of the beuatiful background paper would show. I trimmed off the excess and used a bit to accent the left side of the photo. 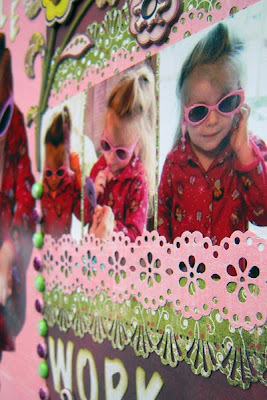 I mounted the photo and cut the title on Bo Bunny Double Dot (available at Lil Lamb's) . 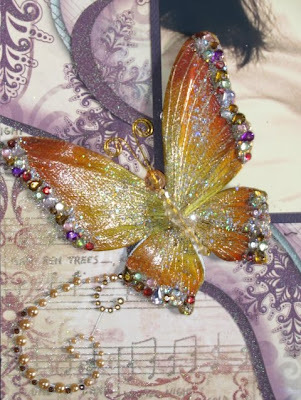 I added the Prima Say it in Crystals Flourish, Bejewelled Butterfly, three Robins Nest Dew Drops and a bit of journalling and Voila! The stunning papers and embellies in this kit make it easy to create quick but beautiful pages, to grace your memory books! While we're on the subject of Basic Grey's Page of the Month program here at Lil Lambs Boutique, we on the design decided to have a go at some of these kits too. We wanted to provide those of you that have bought already or wish to purchase, some additional ideas for the kits. Below is the kit from December available here, and the wonderful 2 page layout created by Basic Grey Design Team member Kellie Goree. I decided to create two separate layouts using just the products from the kit. The only additional items that I used were Distress Inks for the edges and Stickles (doesn't everyone use those?). 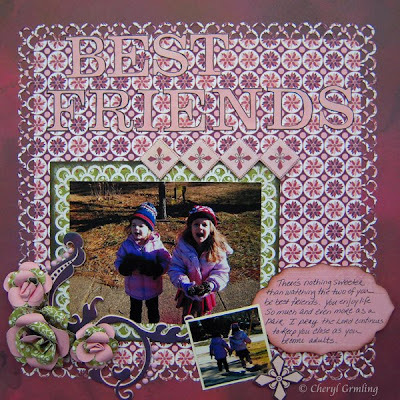 The first layout is of my two daughters on one of our famed adventure walks...their favorite. They so enjoy being together and I had to capture it on paper. 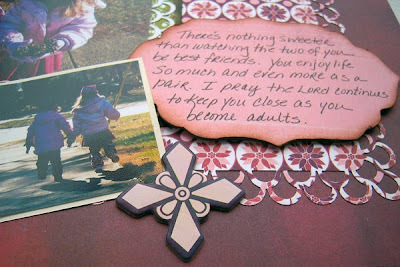 The border on the inner section and the mat around the photo is the Martha Stewart Around the Page Double Loop combo punch. Isn't it divine? 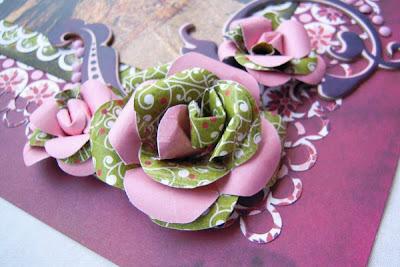 I used 2 different papers, enclosed in the kit, to make these roses (technique by Tim Holtz). Here's a closer view of the Double Loop punch. I decided to outline the letters that came in the kit, with black ink, so I could use them against my similarly colored background. 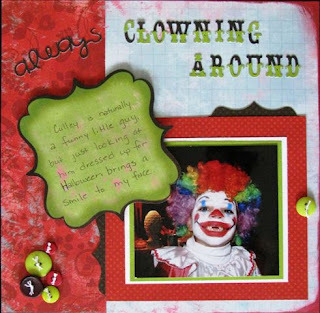 My second page had a plethora of Martha Stewart border punches. I might be just slightly addicted. This is my youngest decked out and proud of it. She knows how to work a camera. These kits really give you plenty of embellishments to work with. 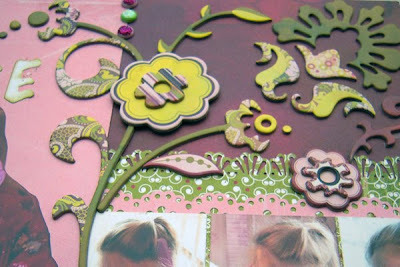 Below is my virtual garden of chipboard flowers. Little tip: Even though these have a sticky backing, I would advise gluing them down anyway. And a final close up of some more of the border punches. If you liked BasicGrey's 2009 Page of the Month program you are going to LOVE the 2010 program! Color instructions- BasicGrey will include color instructions in every kit. The instructions will be more basic and easy to follow with a large image of the layout for reference. 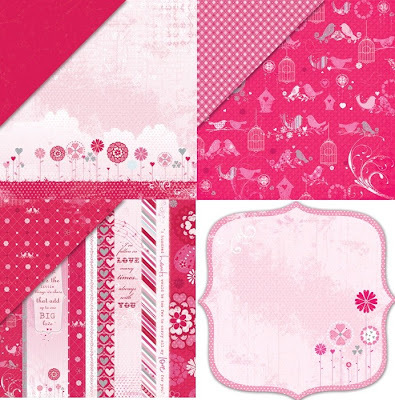 New product- this year BasicGrey will be including only the newest papers and embellishments in the kits. More generic themes- this year there will be different themes to choose from, with different journaling prompts allowing you to scrap WHATEVER you want! New techniques- each month one new technique will be incorporated. Free Exclusive BasicGrey D-Ring album at the end of the program for those that are on the pre-order list and pay for all 12 kits! New kits will be released every two months and an invoice will be sent every two months for the two kits. The last kits will be sent in late December 2010 which will include the exclusive album for those that are on the preorder list and have purchased all of the kits. Sounds great! How do I sign up? 1. You can email me and let me know that you would like to be on the preorder list. All I will need is your name and an email address to send your invoice to every two months. You can also purchase the kits from the shoppe but you must have purchased all twelve 2010 kits to be eligible for the free exclusive D-ring album. 2. Purchase your first two months now and you will automatically be enlisted into the preorder program. You can cancel at anytime but you will not be eligible for the free album at the end of the program. We will only be taking a limited number of preorders- once they are gone- they are gone! Well, it seems that everyone is tired of winter paper, and ready for spring! I guess that's why the LLB design team all seem to be reaching for our bright and fun papers :0) Basic Grey's Nook & Pantry seems to be very popular right now! Tammy still has several super groovy Nook & Pantry items left...go take a peek! Look HERE and HERE. 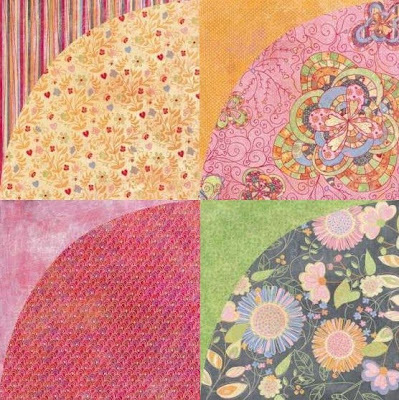 I love the vintage inspired prints...plus, if it has a pear on it..I'm all over it! This is a *to die for* paper line! Well, I'm just tickled pink with new addition of Patti to the design team. Her work is fresh and fun and I love all the neat things she finds to do with her Cricut cartridges. Welcome aboard, Patti! 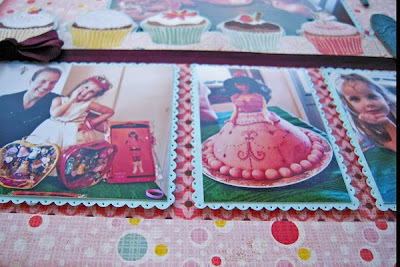 So I snatched up Basic Grey's Nook & Pantry line for my daughter's 5th birthday mainly because of the sheet of cupcakes. I thought it would be the perfect border. A tip for those that don't prefer single photo layouts is to split your sheet in two. I find I often make one page layouts because of the time factor but I don't want every layout to have only one photo or I'll never come close to only being "far behind" in my scrapping. I usually leave a bigger top half and put the central photo up top and then 3 smaller photos along the bottom. 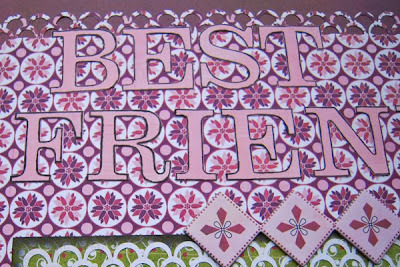 Putting some type of border, to separate the two gives a nice finished look, as I did with the cupcake border and maroon ribbon. 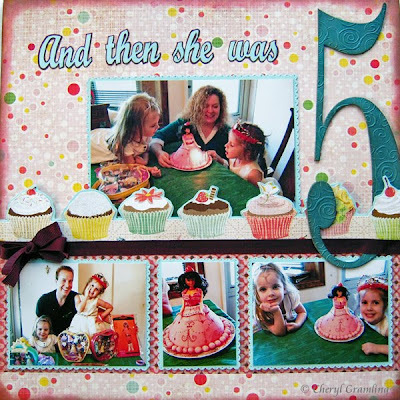 This design will give you a lot of photos on one page and still leave room at the top for embellishments...such as a gigantic number 5. And I hope you didn't toss all those shaped scissors you bought 10 years ago. 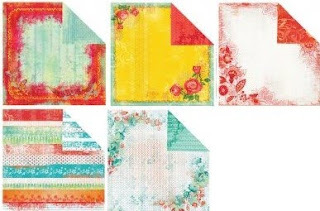 With the onslaught and popularity of border punches, your shape scissors can come to the rescue when a tiny design is needed such as the mini scallop border on my bottom photos. Everything old is new again, right? I freshened the look up a bit by punching holes in each little scallop. Finally, a funny birthday story to wrap up. My oldest daughter asks for a Strawberry cake every year....what? no chocolate? Not anywhere. So I work to make this Strawberry Barbie cake for her and would you believe the rascal only wanted the pink fondant balls around the bottom. Next year, I think it will be a chocolate cake with dark fudge chocolate icing and I'll throw a strawberry on top for her to eat! Hello! My Name is Patti Weigel and I am so excited to be the newest member of Lil Lamb's Boutique design team! I'd had this picture of my daughter in my "need to scrap" drawer but could never find just the right paper. 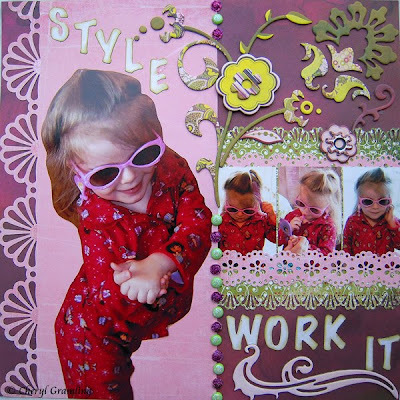 Then I received the Bo Bunny ~Persuasion~ Deluxe Scrapbook Kit and I knew I'd found it. 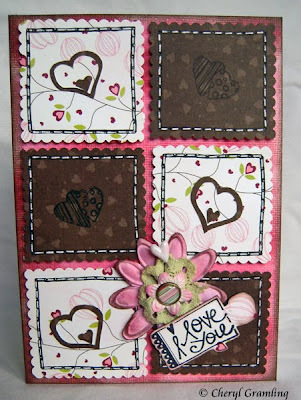 I just love the die cut paper and the cut out journaling cards in this kit. I used my Cricut Gypsy to weld the title "5 Things" and cut out some hearts from the Gypsy Wanderings cartridge. 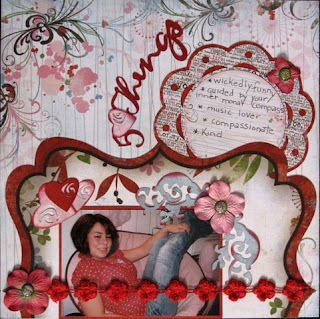 Embellished with some ribbon, Prima flowers and matching brads completed this layout! So simple when all the coordinating papers come in a kit! After I finished, I wanted to see how many layouts I could get out of this kit. I completed three layouts! Number two came together so cute and has a completely different feel. At first I thought that these papers were too feminine to use for a boys layout, but soon found how wrong I was. 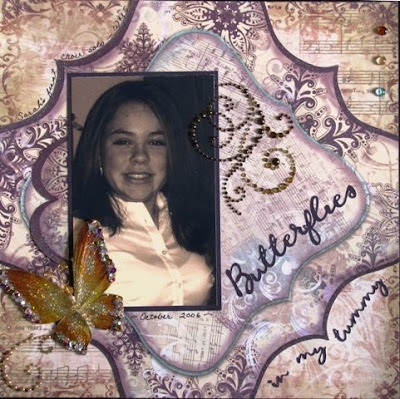 On this one, I again used the cut out journaling cards and my Cricut to cut out the letters and brown shapes tucked behind the photo mats. I did use scraps of Bo Bunny Double Dot (the green and brown) and some buttons to embellish and give dimension. The edges are distressed with Smooch Spritz Peralized Accent Spray by spraying on a to a sponge and rubbing it along the edges. This gives it the most delish sheen! For the last layout I did use a full piece of Bo Bunny Double Dot (not incuded in kit) and pieced all the bits and pieces to create this great page. Three great, completely different looks from one paper kit. What fun!